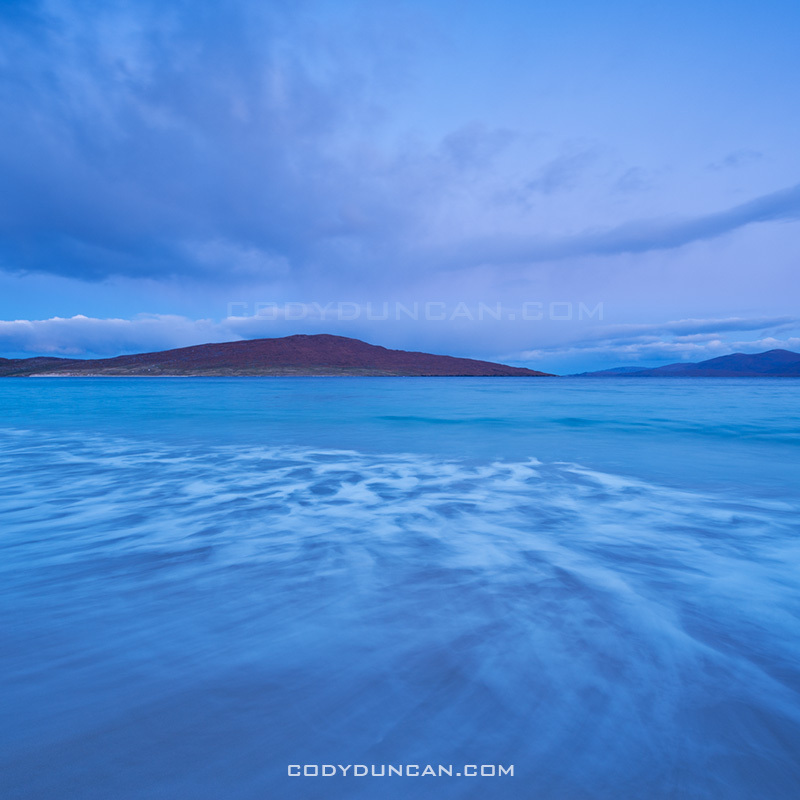 Photo: View over Sound of Harris, Berneray, Scotland. 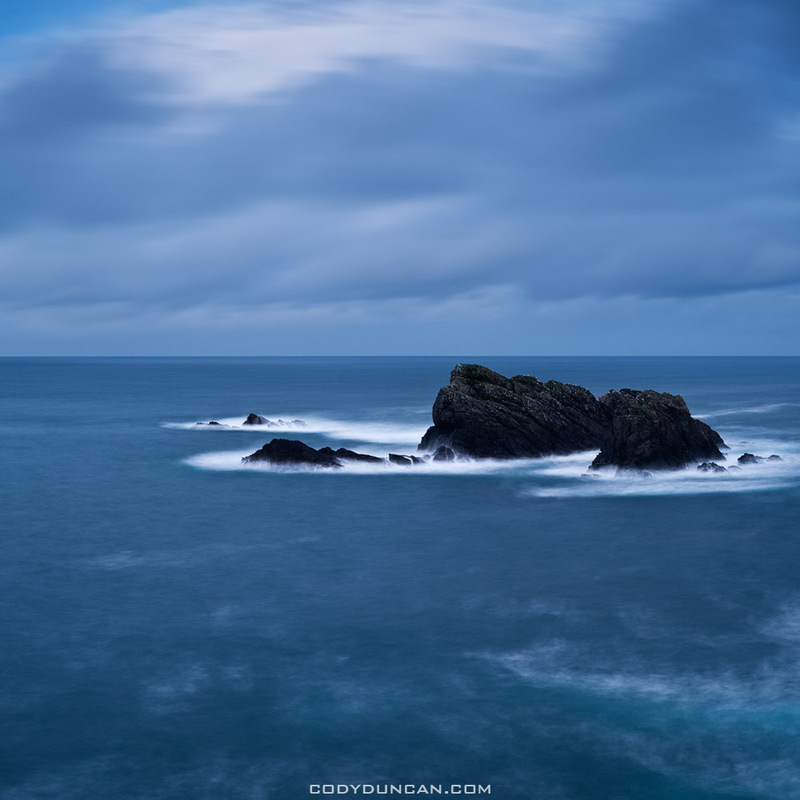 For the New Year I’m heading up to Scotland and out to the Western Isles. 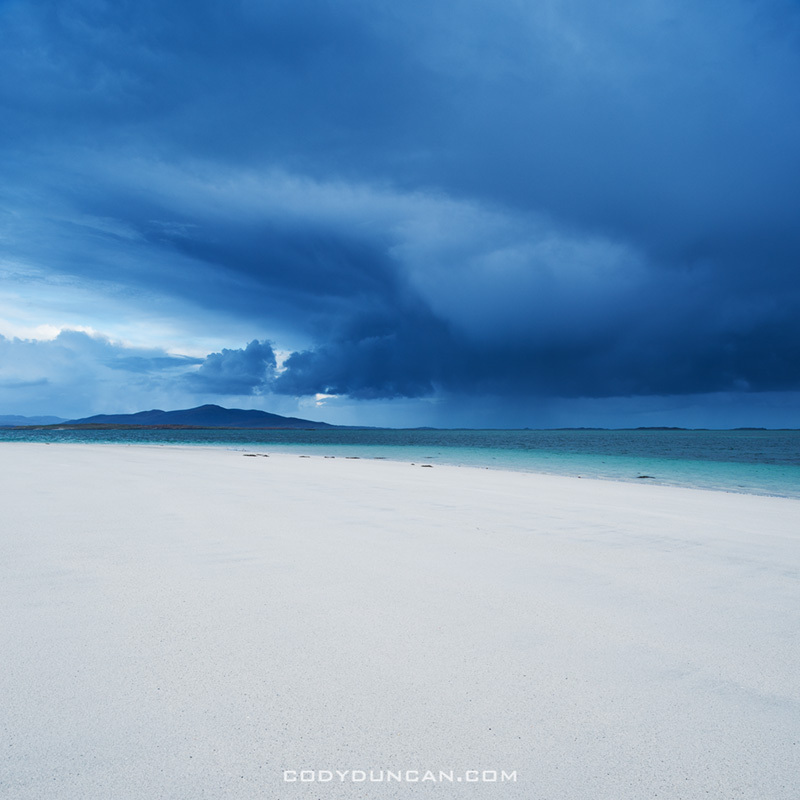 I’ll spend New Year’s eve at the cool little hostel on the island of Berneray, where I had good time last year. The rest of the week I’ll be out and about on North/South Uist, taking in the epic beaches of south Harris and exploring the historic sites of Lewis. –CLICK HERE– For images from last year. 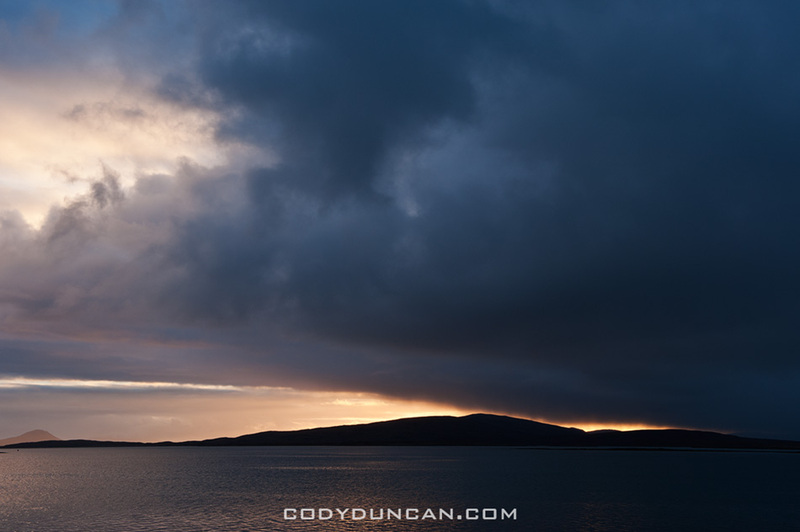 Photo: Sunset over North Uist, Berneray, Scotland. 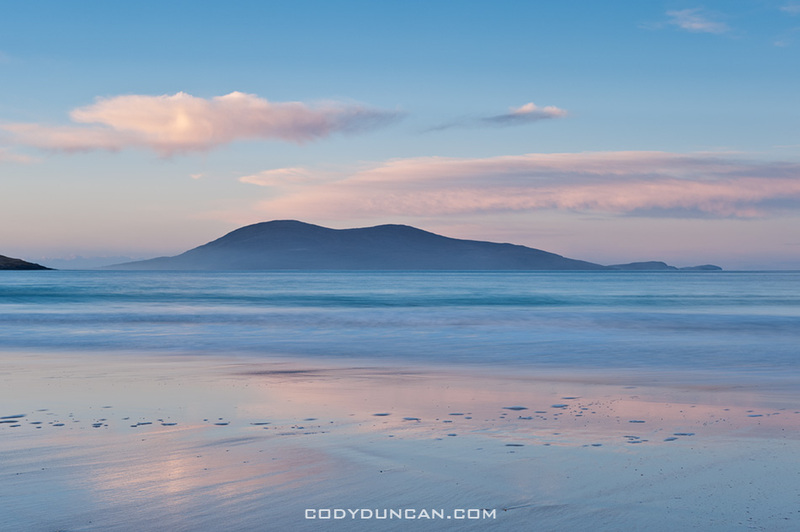 Photo: Luskentyre beach, Isle of Harris, Scotland. 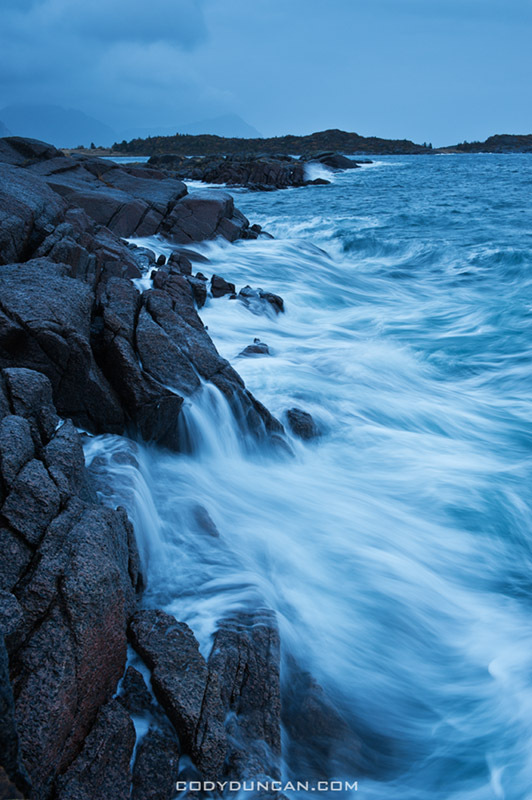 Photo: Incoming tide, Isle of Harris, Scotland. 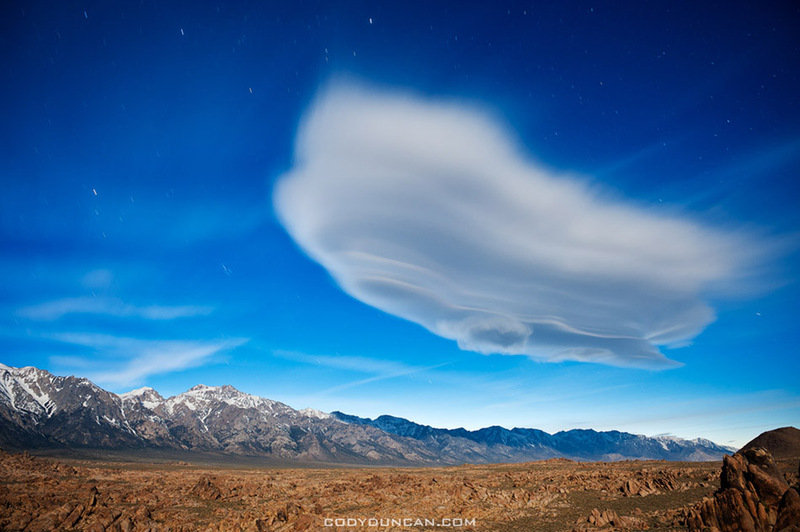 illumination of the foreground and a 2 minute exposure gives a ghostly appearance to the cloud. My 10 best images from 2011. Well, maybe ‘best’ is not the correct word and ‘favourite’ would be more appropriate. I thought about repeating last year’s ‘best from each month’ concept, but it wouldn’t have worked very well for this year. For the most part I was largely directionless for extended periods of time, with the whole of the spring/summer basically a black hole for me photographically. For the year overall there were some brief moments of productivity, but most of the time I was failing to achieve my goals visually. I don’t really feel I grew at all photographically or found myself pushing my boundaries visually. Much of the time I was struggling to even repeat images/ideas that I had made in the past, much less expand my vision and style forwards. Hopefully 2012 provides more fertile ground as this last year seems mostly a waste to me. Barely being able to tread water, much less chase my dreams. 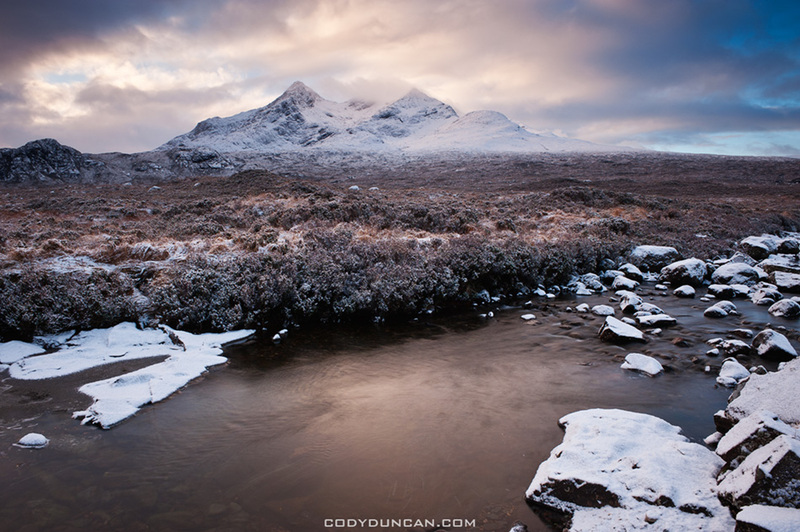 Returning from New Year out on Scotland’s Outer Hebrides I decided to stay the night on the Isle of Skye. As I awoke to heavy clouds and a light falling snow my hopes of sunrise diminished. Sitting patiently and looking at the clock, I waited an hour to see if conditions would improve before continuing on the long journey south. Just as I was about to start the car I noticed a bit of contrast in the sky. I had dreamed of a ‘Skye in snow’ image for years and this was my first chance. While it can definitely be improved upon, I still am glad for the opportunity. I’m fascinated by standing stones. This was my second visit to Callanish in as many months. 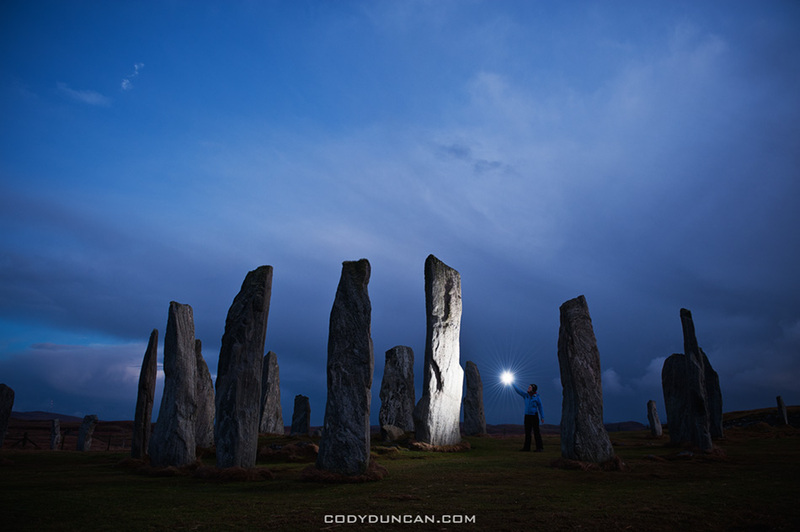 The rain held off into the night allowing me a bit of time to play around with some lighting of the stones. I think this image helps show a bit of scale and how large the stones actually are. Winds and heaves seas battered this most northerly part of the Isle of Lewis. Rain showers were sweeping across the headlands with only brief interludes as the short winter day transitioned into night. Beyond these rocks is 500 miles of the cold north Atlantic before one reaches Iceland. Truly a feeling of being at the end of the world, or perhaps just Scotland. With a 13 hour drive back home to California I struggled with the decision to get out of bed in the early morning hours or not. I couldn’t see the sky from my campground, but I went ahead and made the 30 minute drive down the coast to Bandon. I arrived to the sound the fog horn blasting into the morning darkness and the roaring of waves against the coast. On the beach conditions were better than I could have expected. 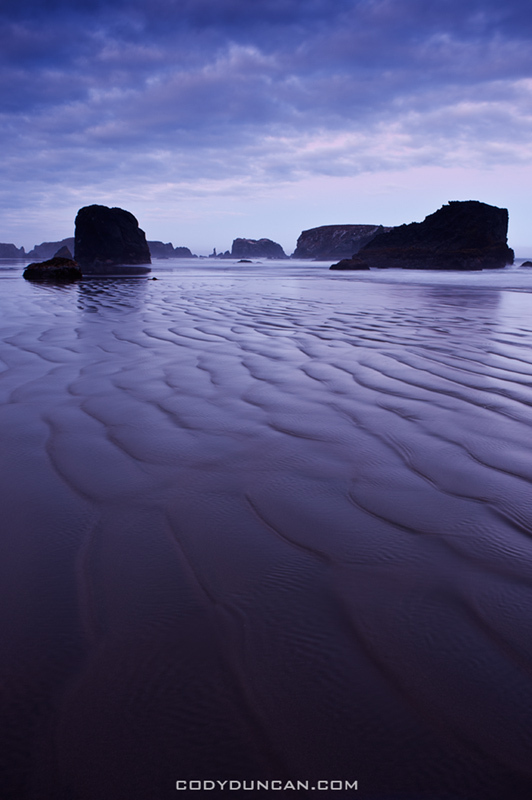 Low tide and a calm wind, perfect for Bandon. As the morning progressed a bit of color arrived before the dawn. I was utterly exhausted by the time I got home late that night, but thankful for it. It had been a last minute decision to head to the Grand Canyon. Arriving in early evening to a foot of fresh snow on the ground and the possibility of the closure of all national parks due to the failure of the govt. to pass a budget I wasn’t really sure it was worth it. Awaking the next day to a snow covered campsite and gray skies, I went out exploring a bit. I hadn’t been to the GC in 10 years and finding my way around snow covered roads took a bit of extra effort. 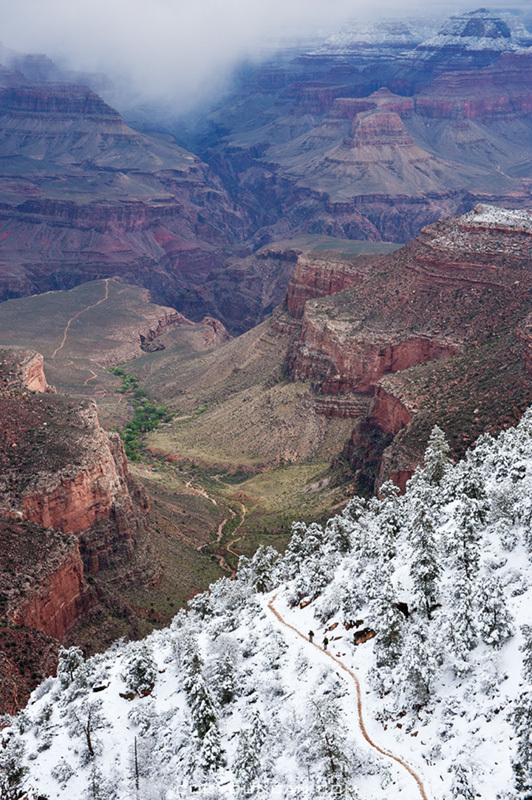 At some point in the morning the storm began to clear and I found my way to the upper section of the Bright Angel trail. I like the contrast of snow and desert in this image, a sight I don’t see too often. This is one of my favourite view points while staying in Stamsund. Not because it’s the most spectacular view in the world, but because it’s a place I can return to again and again and always see something new. I can watch the spring sunrise from here. I can see the autumn’s first snow or (as in the next photo) the sky filled with the Northern Lights. 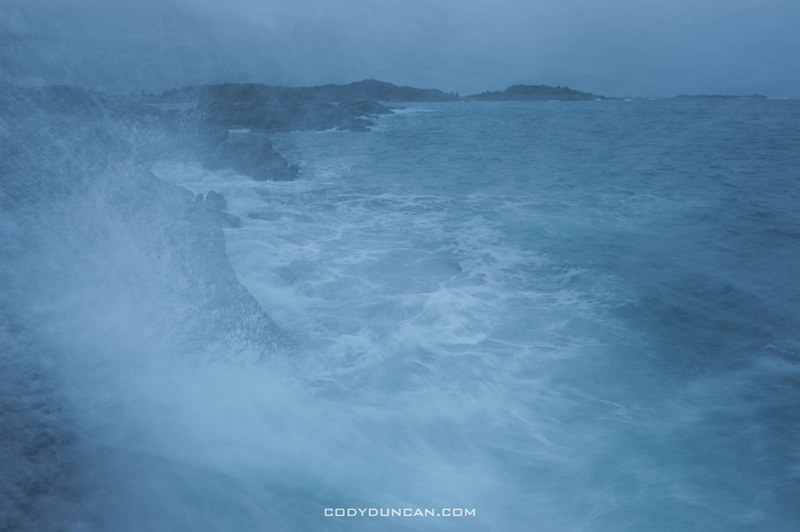 The sea can be rough and white capped with mist filling the air or as still as a pond. 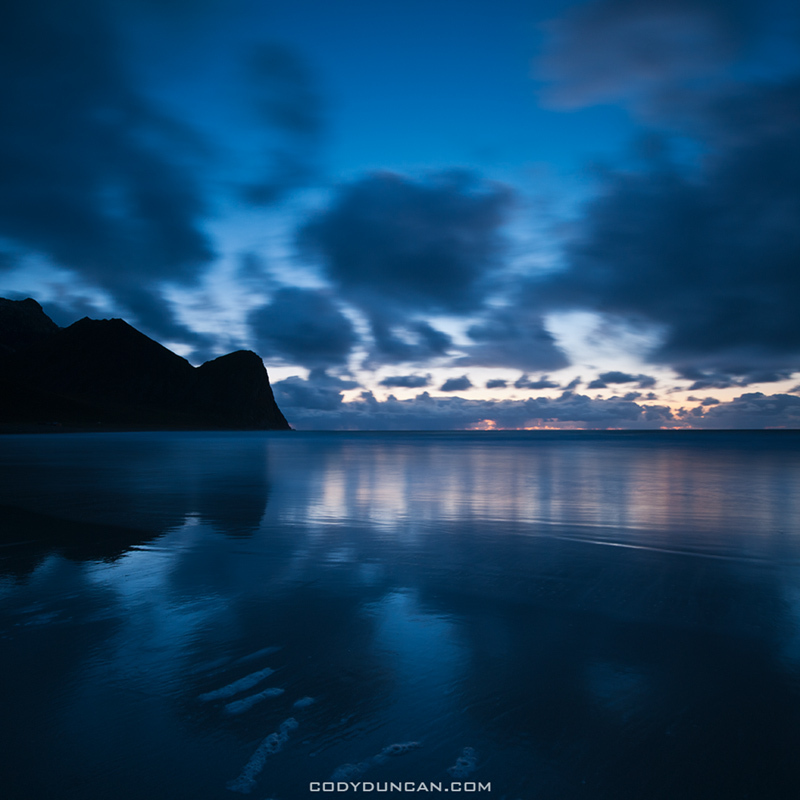 This view reflects the moods and temperament of the Islands. 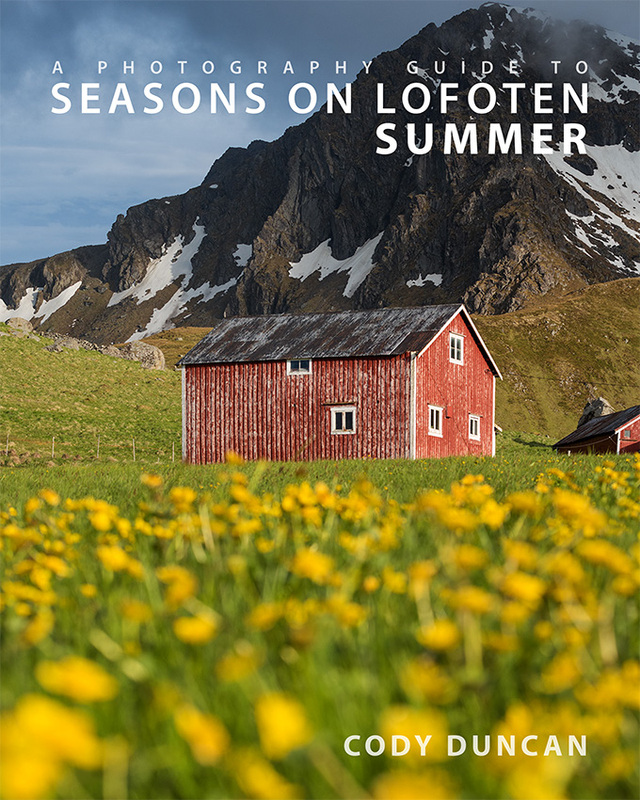 The last night (beginning to see a trend here) of two weeks on the Lofoten Islands. The perfect conspiracy of conditions for the best Northern Lights I’ve ever seen. I wish I had had a wider lens to show more of the sky, as it was completely filled with light, dancing and swaying from second to second. 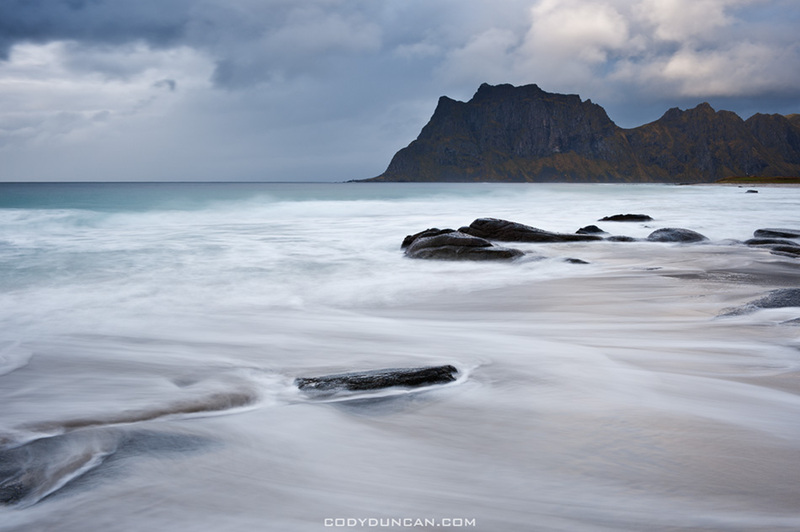 It was another one of my stormy days at Utakleiv. The tied seemed particularly low this day and I wandered out on the slippery rocks towards the edge of the sea. 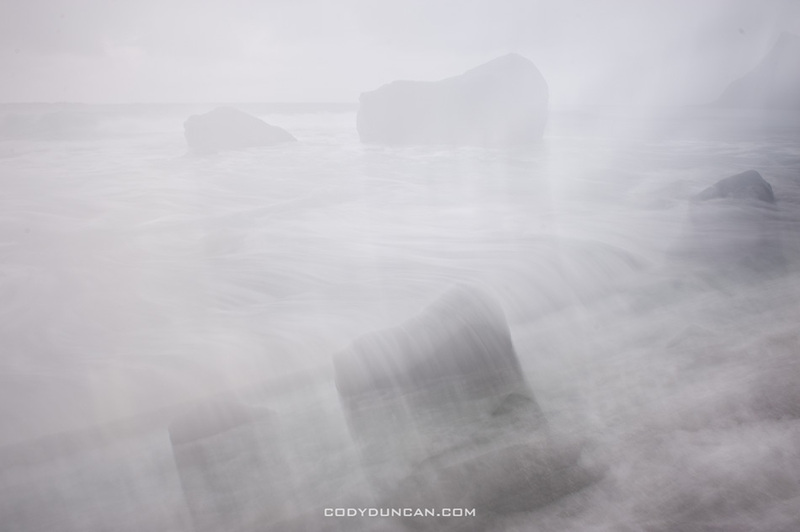 My attention was focused towards my feet as the rain forced me to keep my lens pointing downwards. I came across this scene of one rock burrowed into another. The work of a 100 years of waves. Towards the end of November I found myself back among the old familiar rocks of the Frankenjura region. 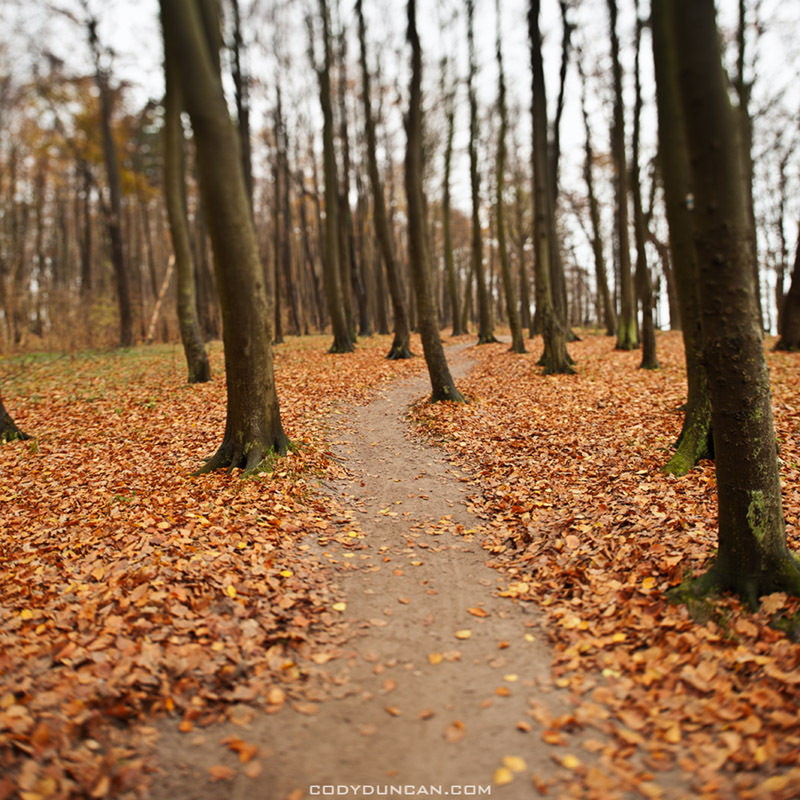 Dark and misty forests, cold temperatures and short days. Not the most ideal climbing conditions, but so it goes. 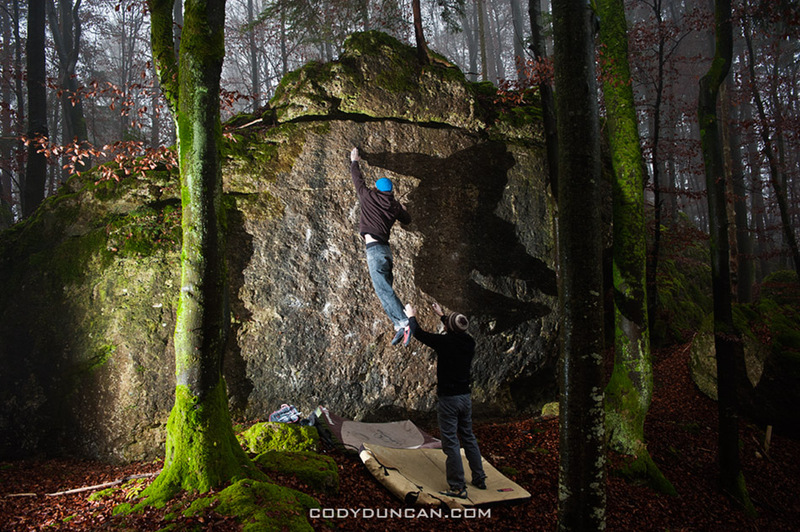 A bit of off-camera flash in the middle of a dyno to the next hold gives a bit of depth to the image. I’m pretty good at watching waves, but there are times while trying to push things to the very edge that I wait a little too long and have to go running. Here are a couple outtakes from being a little too close to the elements. 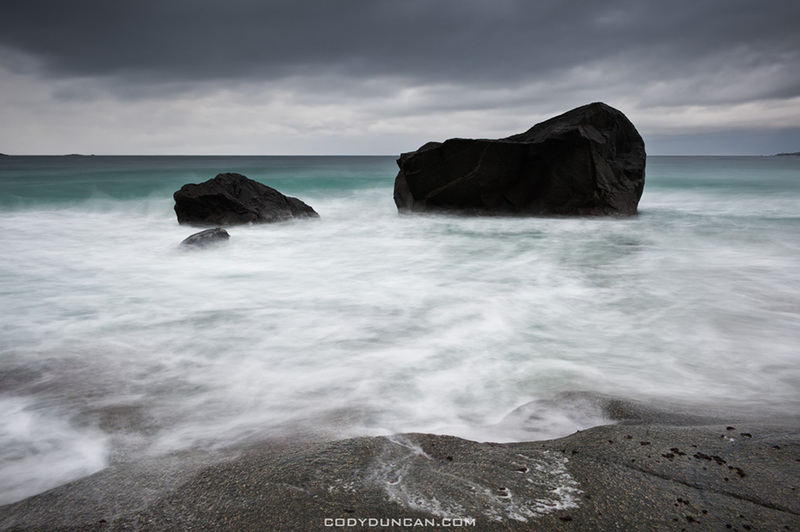 In the first series I managed to grab my tripod and hop away onto another rock with only slightly wet shoes. In the second set I was able to shield my camera, but was basically given a salt water shower as the wave crashed over me. I was in a safe place behind a small jetty, but had to dry myself off by the fire for a bit. 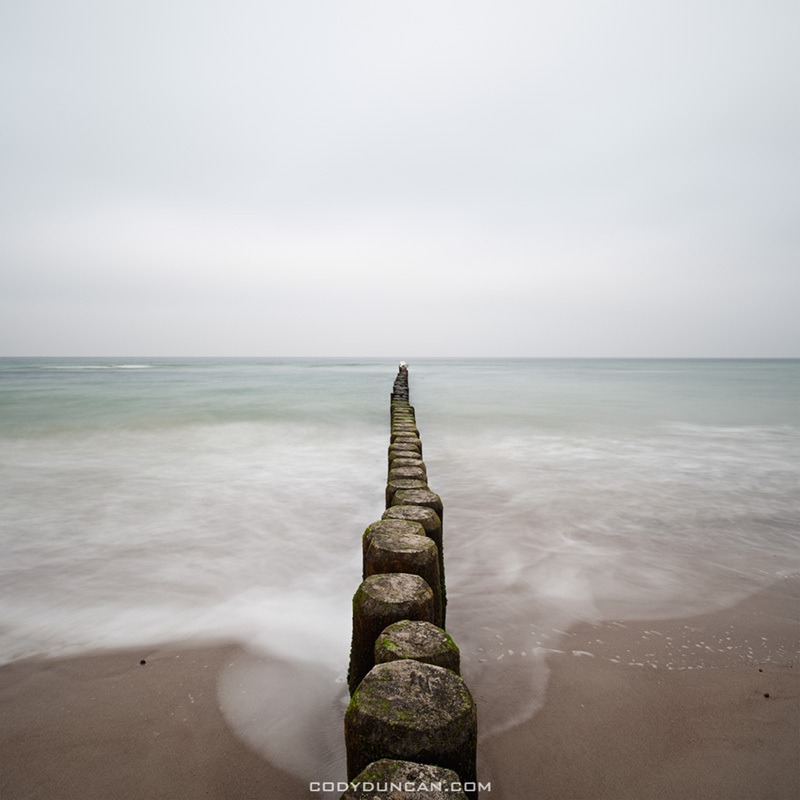 Gray November along Germany’s Baltic coast. Probably not the best time to go for a swim, but there’s still a few interesting things around. Despite appearances of a pleasant sunny day, it was raining 6 minutes after I too this image. 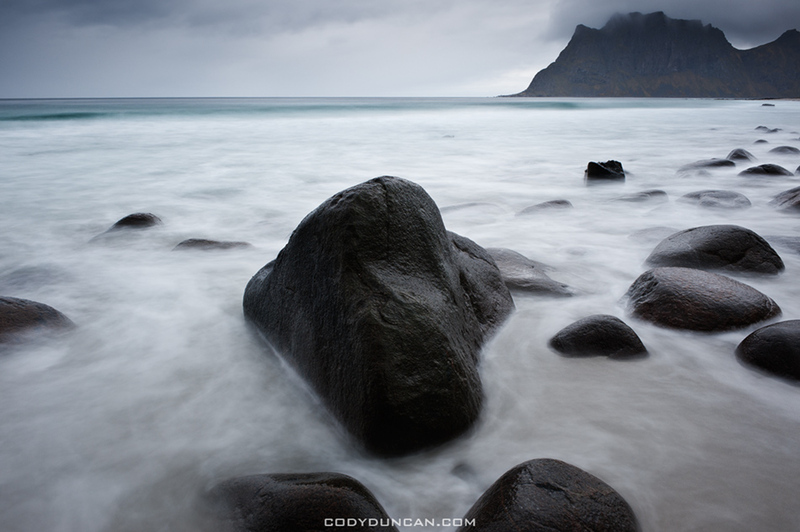 Utakleiv is one of the places where I can return to again and again and always find something new. The only thing that I never seem to see there is the sun. I’m sure it does shine from time to time, just not whenever I happen to be around. As much as I would like to take a photo of the bright sand and crystal blue water with a nice sky full of puffy white clouds, I think this will always remain hidden from me. 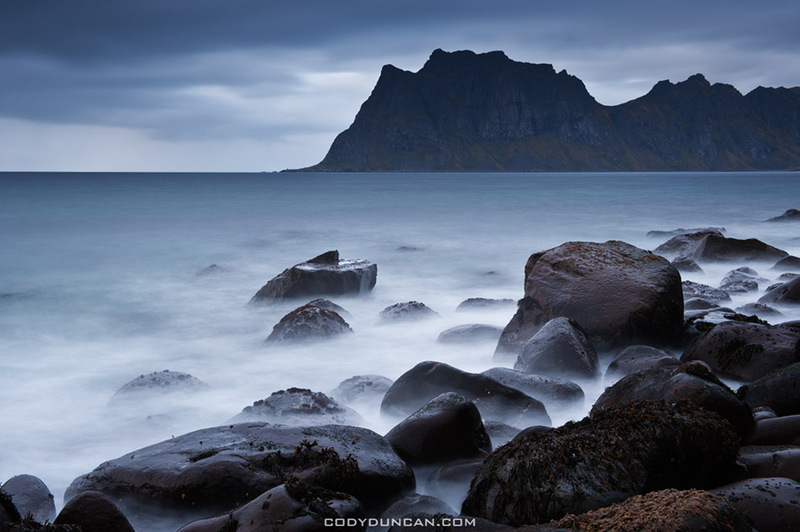 So I must be content with the dark, moody days at Utakleiv. Always watching the sky to see how much longer I can shoot until the next rain shower arrives and I’m completely soaked. Waiting for a lull in the wind so I can hopefully get a sharp image. Timing the waves so I can stand right on the edge of the sea and not walk away with wet feet (though I often do). I think I work best under these conditions, on the edge of the elements. Bad weather makes good photos I keep telling myself, perhaps hoping that if I say it enough it will become true. And perhaps to keep my mind from wandering to a warm fire and hot cup of tea as I stand there cold and wet waiting for light that may never arrive. Here’s a few images from a couple different days in Sept/Oct. Winter arrived in the mountains of Brecon Beacons national park this weekend. So as the weekend came, and with a friend visiting, it was off to the mountains for a bit of hiking. 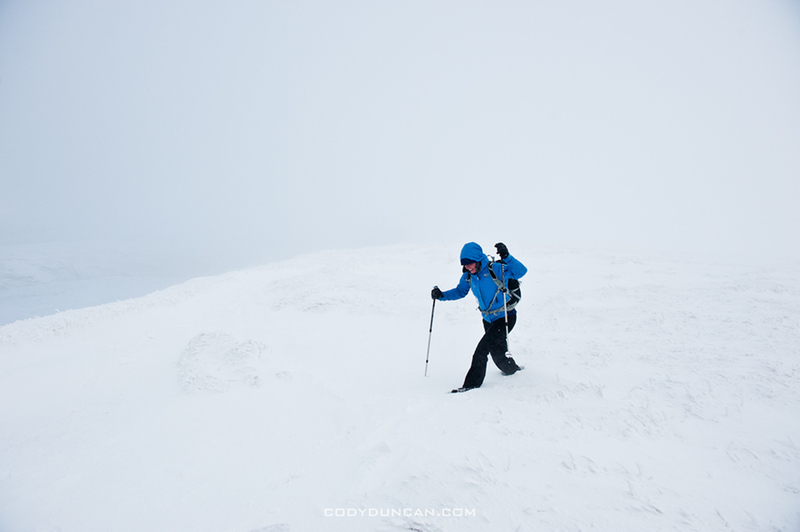 Saturday we headed out west to the Black Mountain range for a hike up Fan Brycheiniog. Well, there was no plan really, but as we arrived on scene to less than ideal conditions, it was obvious that it wasn’t going to be a super long day in the hills. I had actually been hoping for colder temps to freeze the super-bog of a trail that makes up most of the approach, but nope, not cold enough and the super-bag was as bad as could be. Not to mention it was covered in a layer of snow so it was difficult to avoid missteps into the mud at times. 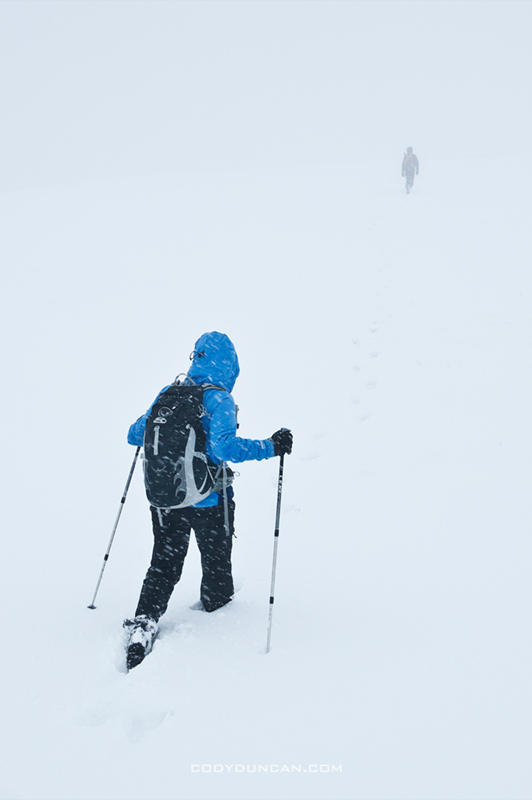 The path up the hill hill to Fan Brycheiniog was barely visible and had sections of thigh deep snow drifts. Once on higher ground, snow stayed about ankle deep for the most part with deeper drifts here and there. Winds were in the region of 40-50mph once up high, with a face stinging icy snow falling most the time. It was pretty much impossible to look into the wind, so we had took look down at our feet if walking into the wind – which was the whole way up the mountain. We were more or less in whiteout for most the hike as well, but the clouds cleared from time to time giving a nice view over the frozen land. 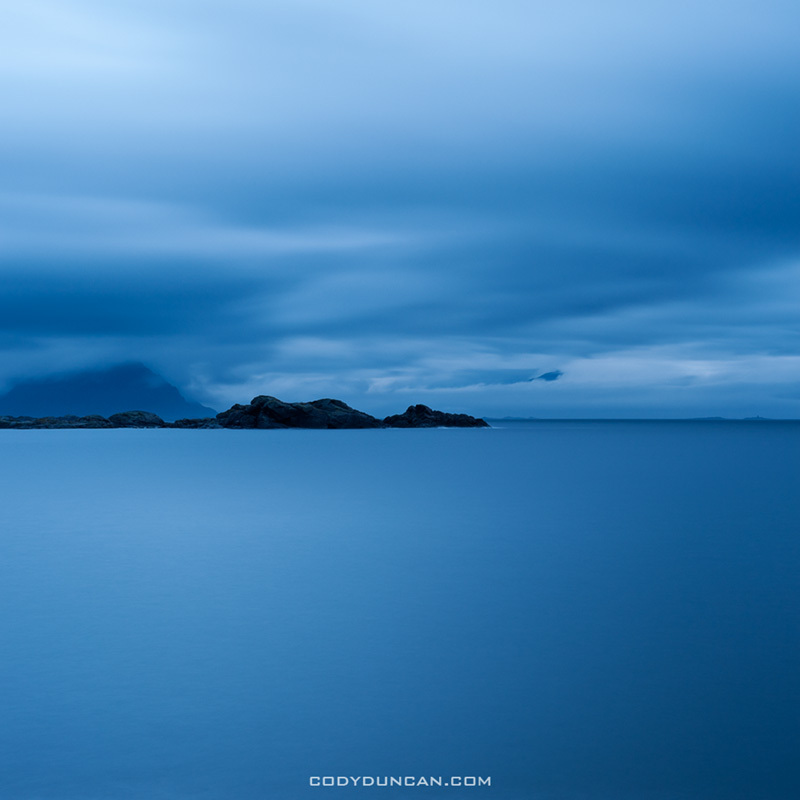 Photo: Dark skies over Vestfjord, Stamsund, Lofoten Islands, Norway. 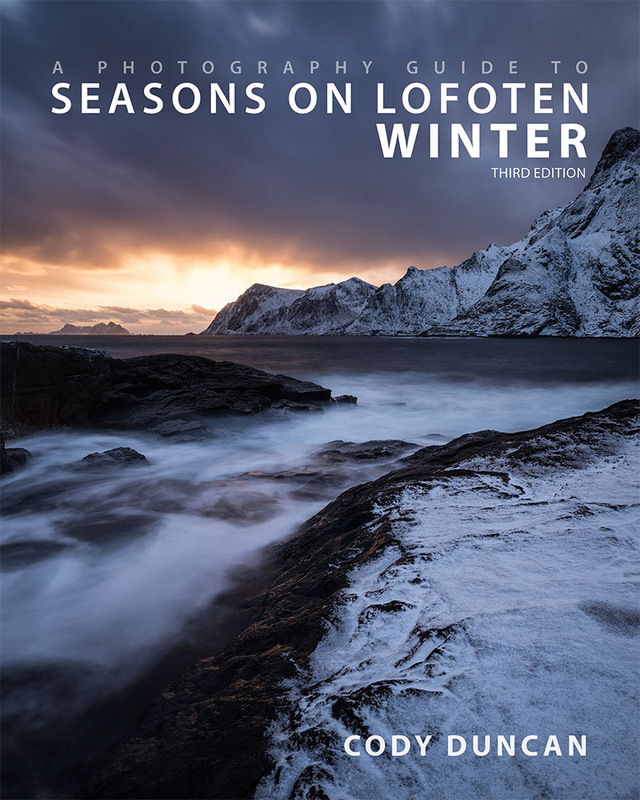 —-CLICK HERE— To go to the Lofoten autumn gallery. It’s taken a few months, but I’m finally getting a few photos online (60 so far) from my Sept/Oct trip to the islands. I’ll keep updating things over the next weeks as well, so keep checking back! Overall it was quite a stormy, yet warm autumn. Often there was a southwest wind which brings an awful misty rain much of the time, especially on the days I was hoping to go out camping. 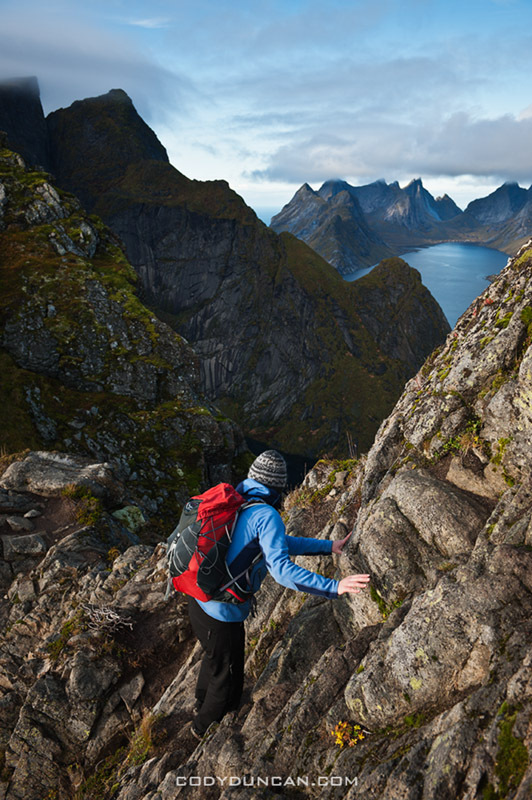 Overall, Norway had the warmest November in 111 years. There was one brief night of snow a week into October, but nothing like the cold I experienced in 2009. So no pics of nice snow capped mountains this year. I found myself struggling against wind and mist or rain nearly every day, often with only brief moments of better weather. A few days into the trip a big gale arrived that cleared most of the trees of their leaves, leaving the forests mostly barren and ugly looking. 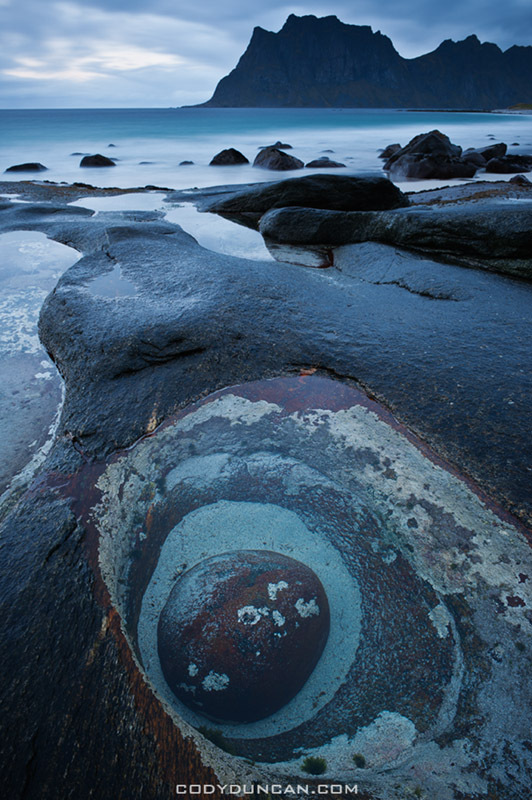 This led me to have a greater focus on seascapes that I was originally intending, but that is how it goes in the north. 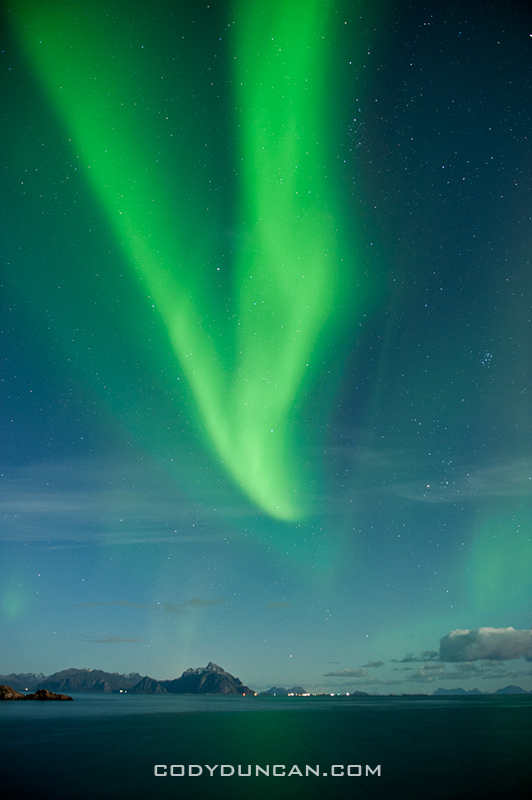 And despite the weather, I still managed a fantastic afternoon up on Reinebringen and on my last night conditions were near perfect for shooting the best Northern Lights that I’ve seen thus far. I often get asked for info about travel and photography on the islands. My best piece of advice is to give yourself as much time as possible, the islands need lots of it.